By using the knowledge of natural soap from my ex-work place Ganko Hompo (natural detergent maker in Chigasaki), I held a quick natural detergent workshop at Spice Dog in Shimoda city. It was part of a local music event organized by Yumi who also worked at Ganko Hompo with me. It was about 1 hour long and the workshop was full of fun with stain off experiment with lipstick or sharpie by using many different type of detergent. We had about 15 attendees on the outside deck and my wife & kids were also there to support my presentation. 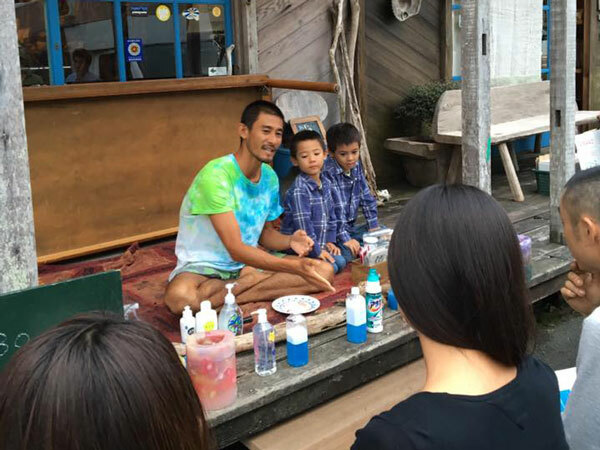 Natural detergent workshop is the lifework of Kim Chin who is the founder/owner of Ganko Hompo, and also the founder of Beach Money. By remembering Kim Chin’s presentation in the past, I tried to make my workshop clear and concise, and also enjoyable for families. Through my presentation this time I think everyone at the workshop has better understanding of the relationship among EcoSurfer, Beach Money and All thigns in Nature. All work toward the same goal – cleaning beaches all over the world. Please contact if anyone would like to have my natural detergent workshops and lectures on top of my other regular activities like a presentation about Beach Money, beach glass craft workshop, and beach clean up event. No travel expenses need to be covered for educational institutions unless it’s an extended trip. Other organizations companies are also welcomed.